When I sew this picture on Facebook I "fell in love" at first sight with this shawl. It inspired me to make my own one with the many leftover yarns I keep in my stash. I just had to buy some blue turquoise wool to be complete. 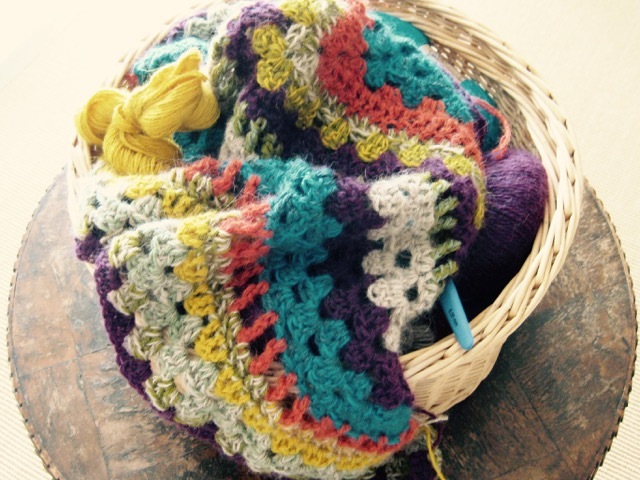 Without pattern, I thought of starting my shawl by using the Half Granny Square method that is very easy, and then I tried to create new stitches when changing the color yarn. 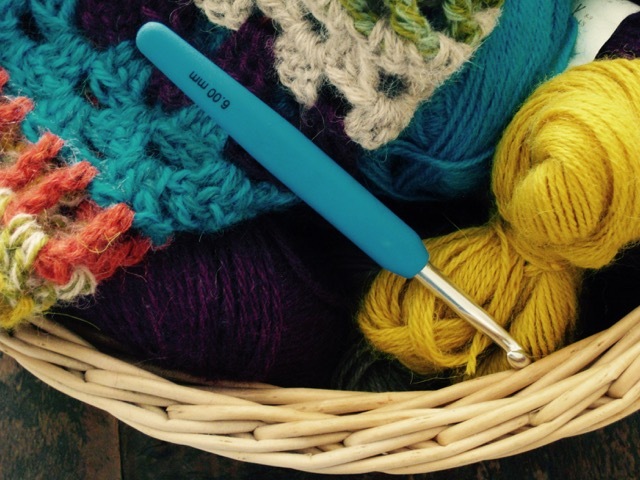 Like for quilting when I enjoy so much sewing scraps, and my favorite quilts are the scrappy ones, for knitting I love to use and mix various colors. It is very creative and a way not to be bored by using the same color all the time. And I find the result always very personal and joyful. I used mainly Alpaca yarns with double thread and crochet 6 mm. I don't even have words to describe how wonderful this is! You know how much I love scrap quilts, and this is going to be the most amazing scrap shawl. I just adore what is happening here! What a gorgeous shawl!!! And made in alpaca its going to be so squishy and warm! Well I'm crocheting a Temperature Afghan that I saw on Facebook which is a great project to bring me back to my all time favorite yarn craft...crochet. 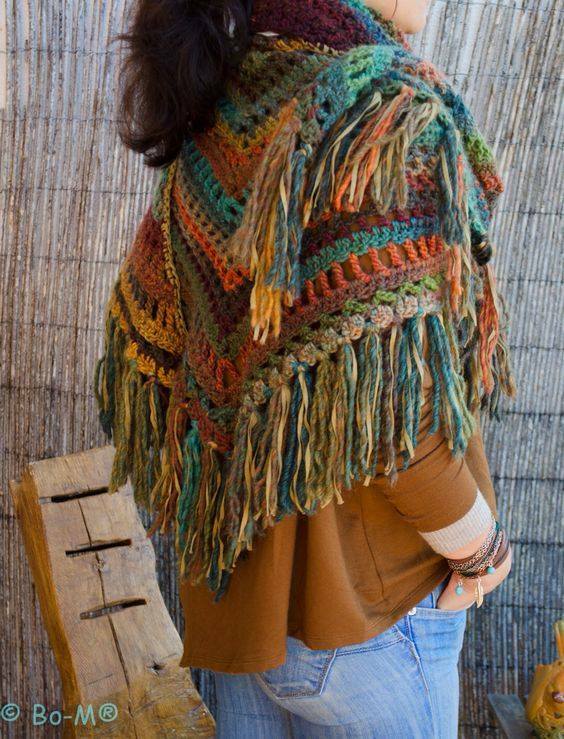 Now you are posting this amazing shawl which is TO DIE FOR and I will have to make one of these...HAVE TO. I sure hope if you do, you will post progress posts. Thanks for sharing this pic....I try to limit FB time, but do you remember where on FB you saw it? That is exquisite. I can't wait to see how yours turns out! I love it! Tu es vraiment très douée pour faire des réalisations en laine ! Après les scrap quilts voici les châles scrap ! 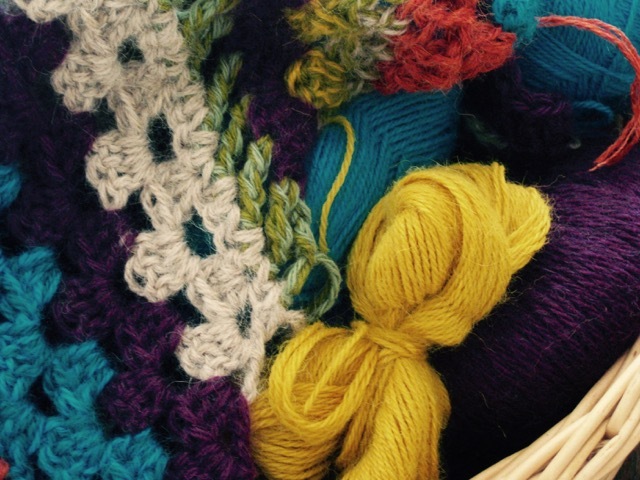 Beautiful yarns and stitches. This will be delightful! This is gorgeous, Christine! No wonder you were so inspired. With all the alpaca, it will feel wonderful, too! I love all those colors together! So cheerful and fun! Ooooh that's gorgeous. The wool and colours are lovely. You make some lovely things! Oh that's beautiful! 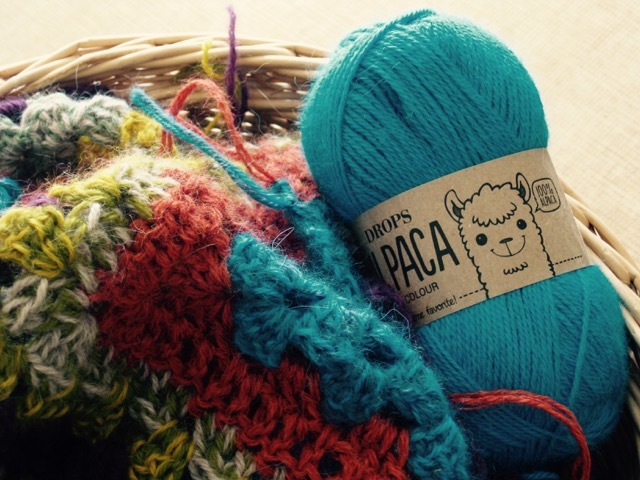 I actually have some of that blue alpaca on the go in a shawl at the moment. It's so soft! And the bright colour is wonderful! What a beautiful shawl! I love your color choices. I imagine this one will go with anything you wear...how useful is that?